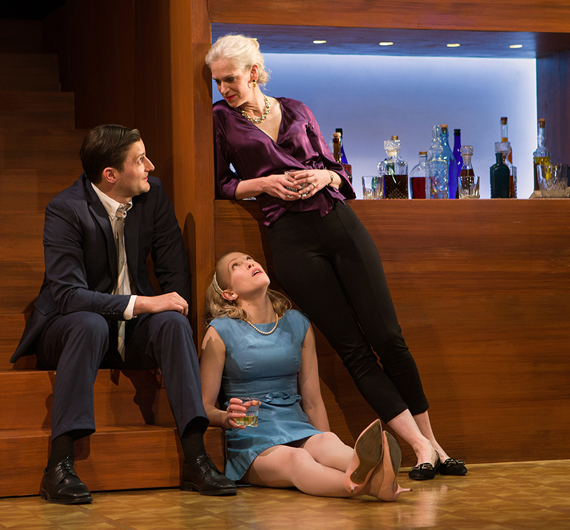 Edward Albee's Who's Afraid of Virginia Woolf? strips bare the deceptions and bonds that hold together two horrible marriages. Shotgun Players' current staging of the 1962 classic strips bare the dynamics of those relationships, without distractions. It's a sizzling approach to a scathing drama, and thoroughly gripping for virtually every minute of its three-hour length. Directed by Mark Jackson, the play unfolds on a bare, parquet-surfaced stage, adorned only by two cubicles filled with dozens of liquor bottles in many colors, brightly lighted. When a scene calls for actors to sit or lie, they ease down onto the floor or drape their legs over its elevated edge. The visual concept for the set -- executed by Nina Ball -- is certainly clean but causes awkward moments when performers have to step on or off the stage, since it's almost two feet high. On balance, though, the approach puts the focus where it must be: on Albee's characters and the four actors who endow them with cruel and poignant life. Up first are Martha and George (Beth Wilmurt and David Sinaiko), she the daughter of a college president and he a lackluster English professor whose career has fallen far short of her expectations. She's volcanic in spewing insults and putdowns, delivered by Wilmurt with as much fury as we may ever see in revivals of Albee's masterpiece. But George is no slouch in the tactics of their savage games, as he proves throughout the duels and most powerfully in the drama's devastating conclusion. The narrative takes place in the pair's on-campus home, after a late-night party that has left them soused before the action begins. When they are joined by a younger couple that Martha has invited, with no input from George, the emotional temperature slowly comes to a boil. Their guests and victims-to-be are a robust biology professor, Nick, and his fragile wife, Honey. Josh Schell and Megan Trout fill the vulnerable roles expertly, with Schell revealing Nick's feelings through a superb symphony of facial expressions. Megan Trout and David Sinaiko watch a seductive dance by Beth Wilmurt and Josh Schell. Martha has apparently invited the couple because she sees Nick as a potential stud, a role that seems to have been filled by many in her college community. Their arrival does nothing to tone down the rage and mockery flying between hostess and host, even if it initially embarrasses Nick and Honey. With continuously flowing liquor dissipating what few inhibitions Martha and George possess, the gathering peels away secrets that brought about both marriages and holds them together despite stresses that would make more rational people sprint for divorce court, for psychological safety. Written in an era when the idealized American family could be found in such TV hits as Leave It to Beaver, Virginia Woolf broke new ground for candor on stage and eventually on big and little screens. The tale's age shows in at least on other aspect: language. 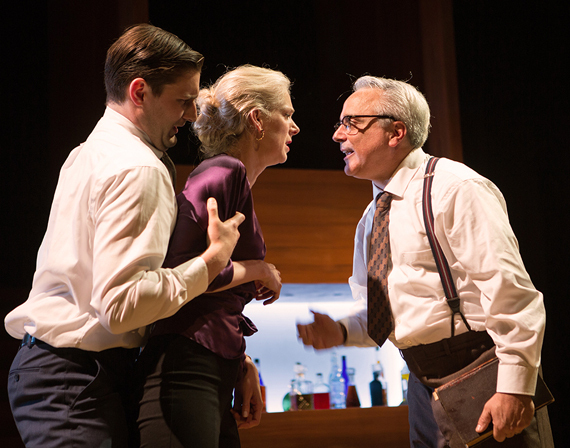 Despite the viciousness of the interplay, Albee used none of the expletives that we would expect in a 21st century play that employed similar characters or situations. 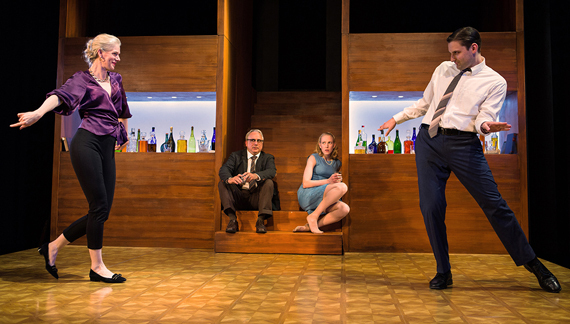 Virginia Woolf dates from an era when four-letter words were taboo on the commercial stage. More than 50 years later, its precise and literate dialogue reminds us that verbal violence doesn't need gutter language to pack a knockout punch. In the Berkeley theater's very capable hands, Albee's language and explorations of mystifying bonds that can keep people together are as powerful today as ever. Schell, Trout and Wilmurt, and lots of booze to fuel their action.